Awesome Ada Lovelace Day news! This week saw the announcement of a couple of pieces of Ada Lovelace Day news that I’m very excited about. Last year’s day was fantastic, but this year’s is already shaping up well and, dare I say it, may be even better! We’re partnering with the Royal Institution for Ada Lovelace Day Live on 14 October. This is just the most awesome news, not least because the Ri is the home of the Christmas Lectures and their lecture theatres is one of the most iconic venues in science. Michael Faraday, of whom Lovelace was a huge fan, began the Christmas Lectures there in 1825, as well as the Friday Discourses. Tickets will go on sale later in the year, direct from the Ri, but there’ll be very limited amounts as the lecture theatre only holds 440 people, so make sure you sign up to the Ada Lovelace Day newsletter to be the first to know! 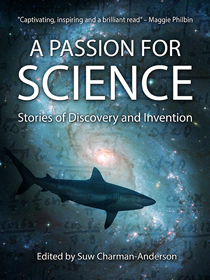 After the success of our first anthology of writing about women in STEM, A Passion for Science: Stories of Discovery and Invention, we have decided to produce another. This time, we are opening up a formal call for contributions of articles about notable women or groups of women in science, technology, engineering and maths, as well as interesting users of technology. Initially, we are asking people to send us 250 words on the woman or women that they want to write about, explaining why they are notable or interesting, along with a link to a writing sample. Ultimately, we’re looking for 20 articles of between 2,000 and 6,000 words. At this point, we don’t have any kind of budget, but we’re hoping to raise some money to pay for editing, cover design and an honorarium for writers. Profits go towards supporting Ada Lovelace Day, which remains essentially a budgetless organisation run by a very small group of volunteers. To find out more, take a look at the call for submissions, author notes, and style guide. The deadline to submit an idea is 28 February 14, and please do let people know!! Via Mary Corbet’s Needle ‘n Thread blog I discovered this fantastic video about embroiderers in Appenzell in Switzerland and how their way of life was destroyed by mechanisation. The documentary paints a fascinating picture of the rural families that earnt a living through incredibly delicate embroidery, supplementing what would have been a meagre income from fairly unproductive small-holdings. The woman of the household would pass on her skills to her children, boys and girls alike. They would all embroider from dawn til dusk and on into the night by candlelight. The school-age children would attend classes, but would still be expected to do significant amounts of embroidery in the evenings. The children who weren’t good with a needle worked at the household chores, often taking on many of the tasks that a mother would normally do so that she could embroider more. Of course, fashions moved on which, along with mechanisation, put many embroiderers out of business. Those changes cannot have been easy for the rural families who depended on embroidery to make ends meet, and who didn’t have many, or any, other reliable income. But the life of an embroiderer would not have been easy either, working all hours and earning relatively little for very demanding work. One mistake would result in money being docked, and they weren’t being paid much in the first place. Whilst mechanisation freed whole families from gruelling work, (although they may not have seen it like that whilst they were figuring out what else to do), it also likely resulted in the loss of many skills. The story is the same across the crafts. As mass produced materials superseded the hand-crafted, the knowledge that allowed those items to be made, that had been passed down from mother to daughter and father to son, was lost, if not in total then in major part. The economics of hand-made items were never good. Time-consuming processes require either low-paid workers or very high prices that only a few can afford. The craft industry these days relies on both models, not just because of sweatshops in the developing world, but also Western hobbyist (or, in some cases, subsistence) crafters who sell their work for the cost of the materials rather than including time and other overheads because it’s hard to sell anything otherwise. The results of this are, I fear, a gradual loss of skill and, worse, a loss of interest in those skills. That’s why I love blogs such as Mary Corbet’s, and why they are so fundamentally important. Although there are institutions such as the Royal School of Needlework who do a great job of preserving and passing on knowledge, craft blogs allow anyone to not only be inspired by the beautiful work on display, but to also learn a little about how it’s done. It is because of Mary’s blog that I’ve picked up an embroidery needle, with the intention of doing something more interesting than just a few French knots. But this is also why I like including aspects of crafting in my work, both my books and my writing. The Argleton project included a hand-embroidered silk-covered edition, and The Lacemaker, well, obviously, makes reference to the making of bobbin lace. I love learning about new crafts, as much as I love learning about engineering and physics – indeed, embroidery involves quite a bit of materials science, with different threads and fabrics behaving in different ways. As the subtitle to my blog implies, I find it easy to nerd out over almost anything, and in that I don’t think I’m alone. There’s currently a boom in interest in knitting, which I hope will be followed by a revival of all sorts of other crafts, including embroidery and bobbin lace. Of course, if anything I write or create helps inspire anyone else to look into our rich crafting heritage, that’s great, but it’s people like Mary we should be looking to, and supporting, as they share their expertise in the crafts for all our benefit.